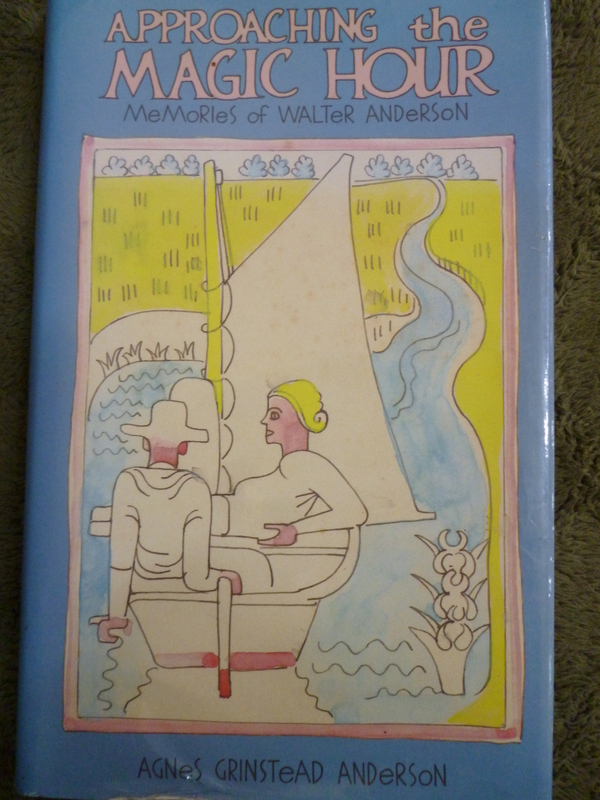 After Daddy was gone and Mama had retired from teaching, she began to write down her memories of her life with her husband, Walter Inglis Anderson. As aften happens with the process of writng and remembering, her original purpose of writing a biography of the artist turned into something more complex and revealing. She could not help telling her own story, and – to some extent – that of her children and other family members. The telling absorbed her and by the time her enormous output was compiled into a small perfect jewel of a book, she was elderly and would soon be diagnosed with cancer. Yet she had her moment in the light, and the joy of living the writer’s life and being embraced by her readers. Recently, I have been writing and remembering my mother, and by so doing revealing myself in relation to her. I pray that my own devotion to this project will be a way of honoring my mother, and also honoring the connection we had as mother and daughter. I have already published one vignette on this blog. Now here is another. From my birth, through my childhood, and most of my adulthood, my Mama had exceptionally long hair, and hair-washing day was something of a ritual. It happened once a week, usually on a Saturday. At least this is what I remember from my own long ago weekend hair-washings, for my hair was also encouraged to grow long and lush. While Mama’s hair was still wrapped in a towel from being dunked, scrubbed and rinsed, a chair was placed backward against the bathroom sink and it was my turn. It was never comfortable – leaning back against the hard cold porcelain, my neck stretched and straining with the weight of my long wet hair – but my mama’s hands were good: long-fingered and thorough, yet gentle and somehow made of love. To keep me from squirming or getting impatient, she told a story. The one I recall, with some amazement, was about the kingdom of the drain devils and the various adventures of the royal couple and their subjects. Mixed with my fascination was a certain frisson of fear; for wasn’t I helplessly suspended above those very drains? There was some relief when my hair squeaked clean and I followed my Mama out to the porch, my own towel turban in place. Once there, we would set our hair free to hang long, loose and accessible to the warmth of the sun. As the story was resumed, I watched my mother’s hair take on light. The top strands broke free from the damp under-hair and rose to make a shining gold aura around her head and upper body. I never could decide if she looked like a witch or an angel. In later years, coming upon my elderly mother, on another porch, but still with the long hair streaming and celebrating its once-a-week freedom from the careful bun, the drying strands danced silvery in the sunlight. I rejoiced at the sight and sat on the swing beside her, hoping for a story to begin. These days it was more apt to be a family legend sort of tale, but whatever it was or however many times I had heard it, I listened rapt to Mama’s golden delivery. I did love to hear of her childhood at Oldfields, when life was more simply and graciously lived, and beauty was an accepted aspect of everyday living. Present-day trips to the supermarket seemed terribly mundane compared to barrels of groceries coming by train from Solari’s in New Orleans. I could just see my little-girl-mama and her sister, Pat, in their lacy white dresses, watching with excited anticipation the opening of those barrels. Another sort of family legend that has stayed with me and affected me profoundly is the story of Malena Gaspari, a young Jewish woman who escaped Spain by cutting off her hair and donning masculine clothing. Her remarkable action saved her life and the lives of her descendants. Her fortitude and courage accompanied me on many a journey that I was sure was of the life-saving sort. Her long ago existence in some way gave credence to my own. Any journey that I feel compelled to embark upon due to untenable circumstances seems blessed by Malena, and also by Mama who made sure that I heard her story. When my mother, Agnes Grinstead Anderson, became a published author, she cut off the hair that for so long had seemed to be her crowning glory. She signed copies of APPROACHING THE MAGIC HOUR in a face-framing bob that gave her a strong assertive look quite different from the long familiar feminine softness of her braided crown or bun. She seemed to come into her own with her words in print, her story told and read by many. I think that during that last year (before her illness) she became her crowning glory. Her whole being rose to the sunlight of fulfillment. It has been a somber week. My little dog, Star, has been diagnosed with Cushings Disease. A small tumor of the pituitary gland is adversely affecting the adrenal glands, and several of the traits that I have been thinking of as Starisms are suddenly symptoms. Her liver is affected and her adrenolin count is greatly elevated. She has been a hungry dog; now it seems that she is a starving dog. At least this is how she feels. She has been a dog that pants almost constantly; now she is a victim of a nearly continual adrenolin rush. The traits I have tolerated as part of the package that makes up my dearly loved and affectionate little dog, have apparently been making my pet uncomfortable and anxious much of the time. Star is naturally cheerful and enthusiastic. I guess this has hidden the fact of her agitation. She has seemed to sleep all night, but I’ve noticed that she moves around a good bit, ending up on the upstairs dog bed with Music. 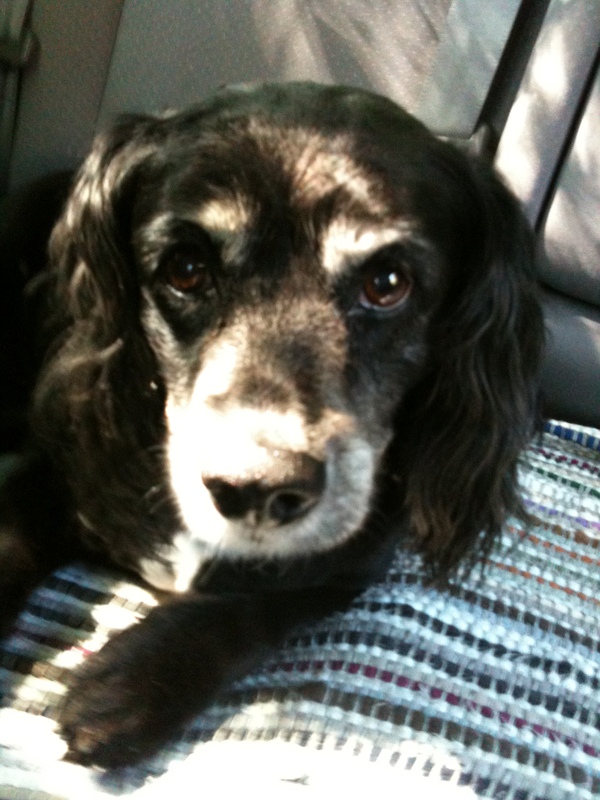 She has been my seven o’clock alarm clock for almost twelve years, and as with most dog owners – this has been both a sweet pleasure and an agravation. The insistent yet gentle paw on my arm, the liguid gaze, and the happy panting response when my eyes creak open are a blessing I am without this week. This is because – on top of the Cushing’s diagnosis and the beginning of treatment – a weakened ligament in her knee has torn. Home from the testing, Star bounded happily to greet my cousin, Adele, and her dog, Oscar, and tore the ligament in her knee. She hobbled painfully back to me on three legs – hoping, trusting her human “Mama” to fix the bobo. Because the vet is reluctant to operate at this time due to the Cushings, she remains three-legged. She cannot make it up the stairs to the side of my bed. We both miss this. You are currently browsing the A Dance of Balance blog archives for May, 2012.